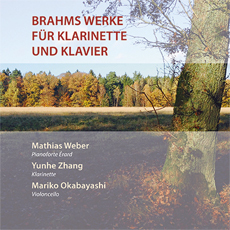 Connoisseurs of Brahms‘ oeuvre for clarinet and piano, respectively violoncello, might counter the critic‘s recommendation by objecting that the new recording of both the sonatas opus 120 and the trio opus 114 by Mathias Weber (piano), Yunhe Zhang (clarinet) and Mariko Okabayashi (violoncello) is the repetition of a reproduction for meanwhile the umpteenth time, however, – apart from the by now somewhat aged recording with Alan Hacker, Jennifer Ward Clarke and Richard Burnett, who apparently plays on a Viennese period piano – all those recordings are representing Brahms’ works on contemporary instruments of our days, which certainly deserves our highest esteem. How elucidating and refreshing though does the actual recording of the clarinet sonatas on a custom boxwood instrument and an original Erard grand piano from 1857 appear, which in its tonal clarity distinctly retraces all the arcs of melody that at times seem to simply be engulfed by various other instruments. – Brahms as a pianist, who predominantly performed on Viennese instruments, was highly captivated by the transparency of the Erard pianos and nourished the lifelong desire to have an Erard grand at his disposal. Thus the composer would certainly have enjoyed the actual recording of his chamber music for clarinet.